So Wimbledon is on the telly and it’s all been very exciting..yadda yadda yadda. But it all got a little bit more exciting when my work sidekick told me about this new website she had come across. She did then have to admit that she had been cyber stalking R-Patz on Perez…but hey ho, we all have our faults! Anyways back to the clothes. The website claims to sell Mod Retro Indie Clothing hence the name Mod Cloth. I just so happened to stumble across this little number and instantly wanted it…. And that my friends is why I want to be a strawberry, or a strawberry shortcake to be precise. It could be all mine for $50 that’s £40 right? The story behind Mod Cloth is actually quite endearing. It was started in 2002 by a couple, Eric and Susan, who were 17 at the time. They originally set out to sell just vintage clothing but have branched out to selling more vintage-inspired pieces. You should definitley have a browse. 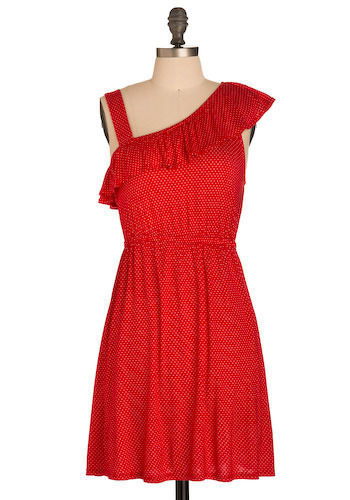 Lovely red dress perfect combination for my new Chanel fake handbag. so cute, i love the polka dots! the modcloth story is out of this world unbelievable. they just got MAJORLY funded!